May buy 1 for yourself and 1 additional as a gift. May redeem 2 per visit. Must use entire value in 1 visit. Valid only for option purchased. Must sign waiver. Must be 18 or older. Younger than 18 must be accompanied by a guardian. Expires 6 months after purchase. See the terms that apply to all deals. 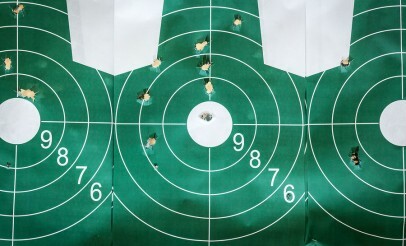 The option for 1 person includes box of 9mm ammo, ear & eye protection, and two targets. The option for 2 people includes two boxes of 9mm ammo, ear & eye protection, and four targets. Rangemasters of Utah is an indoor shooting range with 11 pistol lanes, 2 high-powered rifle lanes, and 3 pop-up interactive steel lanes. They rent hand guns, rifles, shotguns, and for some extra fun and excitement, they also have fully automatic sub-machine and machine guns available for rent. They offer a large selection of guns, ammo, shooting supplies, reloading equipment, and accessories for sale as well.